(Honesdale, October 1, 2016)…For the third time, Honesdale Roots & Rhythm has received a Waste Watcher Award from the Professional Recyclers of Pennsylvania (PROP). This latest applauds the festival for Outstanding Achievement from both PROP and the Keystone chapter of SWAN (Solid Waste Association of North America). Specifically, the 2016 Waste Watcher Award honors the recipients “for outstanding commitment to recycling, waste reduction and reuse in the state of Pennsylvania” for efforts in 2015. Roots & Rhythm’s Sustainability Team, led by Cheryl and Stu Badner of Corporate Waste Consultants, uses a three-container system—marked trash/landfill, recyclables and food waste/compostables – to guide festival attendees to dispose of their waste products. “Our team of volunteers help guide the festival-goers and answer questions,” said Cheryl Badner, “so there is no confusion about what waste to put into what bin. And the system has paid off! In the two years before the recycling program was launched in 2010, Badner points out, Roots & Rhythm collected aggregated “garbage” of more than 4,200 pounds each year. After several years of working towards zero waste, at the end of the 2016 event, the team collected only 360 pounds of trash. There were also 480 pounds of recyclables, and 38 bags of food waste / compostable material collected, compared to zero in each category in 2008 and 2009. Roots & Rhythm won its first Waste Watcher Award for 2010 waste diversion efforts, its second for 2013 waste diversion efforts, and now, its third for 2015 waste diversion efforts. 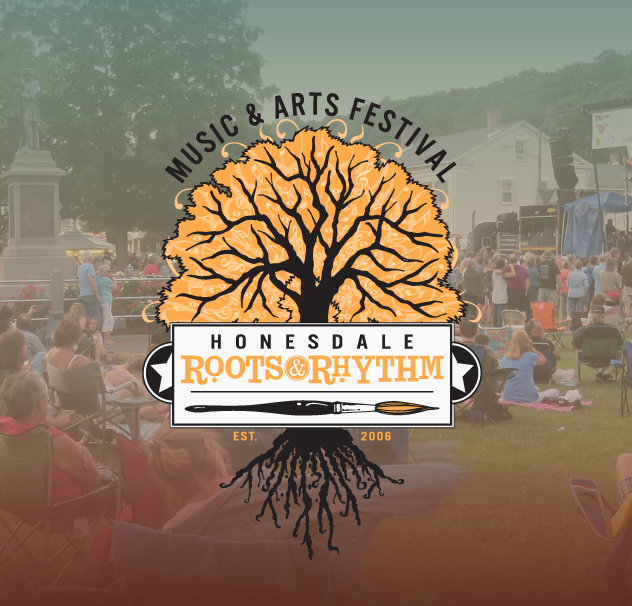 Honesdale Roots & Rhythm Music & Arts Festival, a non-profit free family event, is wholly supported by donations, corporate sponsors and grants from groups such as the National Endowment for the Arts, the Pocono Arts Council, the Villaume Foundation and the Wayne County Community Foundation. It draws up to 6,000 people into downtown Honesdale every year. The festival will celebrate its 12th year on June 17, 2017. Photo: Clearly-marked bins and volunteers help attendees dispose of their garbage at Honesdale Roots & Rhythm, which won a 3rd Waste Watcher Award this year.